Someplace in New England - perhaps the Berkshires, if not there, Vermont, New Hampshire, or western Maine. NHN Grade out of the Ossipee Pit? Conway Scenic? City of Prineville Railroad? 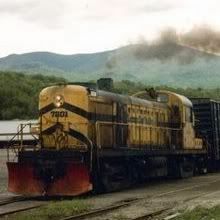 5% Grade in Barre Vt (I've heard its the steepest freight grade east of the Mississippi). Salida on the Southern RR. Is that the approach to Marshall Pass? If so, it would be in the Black Canyon of the Gunnison. I tuned in late today, wife's got me working on some outside jobs. Rule Number One: It's Our Railroad. Rule Number Two: Refer to Rule Number One. This is east coast, not Colorado. Saluda is in the carolinas. Very steep grade down from Saluda to Melrose and at some points over 5%. They originally built two safety tracks to stop runaway trains but only one is needed. speed is 8 MPH tops. This hill has claimed a few trains and lives. But its all history now. Its no longer being used and may turn into rails to trails. Read yoiur last post, you said Salida not Saluda. I have a picture of Marshall Pass that looks very much like it. Probably a typo, the 'u' and the 'i' on the keyboard are right next to each other.